If you look good, you’re going to play well. Do you want to make a statement on the court with a tennis bag that is as stylish as you are? How about 8 different styles to choose from so you can find one you love? The beautiful All for Color Tennis Tote perfectly fits the bill. The All for Color Tennis Tote is one of the most stylish tennis bags available. It comes in 8 different designs to choose from, all made of a decorative polyester material that keeps it resilient to weather and damage. It can be carried by hand or thrown over the shoulder to make it easier for traveling, and comes with a variety of compartments, clips, and pockets to maximize the storage space. Perhaps most importantly, each style includes a racket pocket for maximum convenience. You won’t find many tennis totes that are more roomy or stylish than this! This product is for anyone who wants to show their style everywhere they go. These bags make a statement and are likely to turn heads among men and women alike. The tote style and designs are primarily targeted towards women, but nothing is stopping a male tennis player from rocking it as well! The bag is very roomy for its size, with compartments and pockets to store smaller items, gear, and rackets separately. This makes it ideal for tennis players who need to carry a lot of gear and who want to keep everything nicely organized. Competitive players who travel may not benefit as much from this bag as casual players. This is because there are limited travel features included, with the primary method of carrying it being a shoulder strap. The shoulder strap makes it less mobile than a tennis backpack or other travel-focused bag would be, making long trips more uncomfortable. There are no additional pieces included with the product aside from the features that are attached to the bag. The shoulder strap, pockets, and other pieces are a part of the bag, requiring no setup or installation. Right out of the package you can load it up and head to the courts! 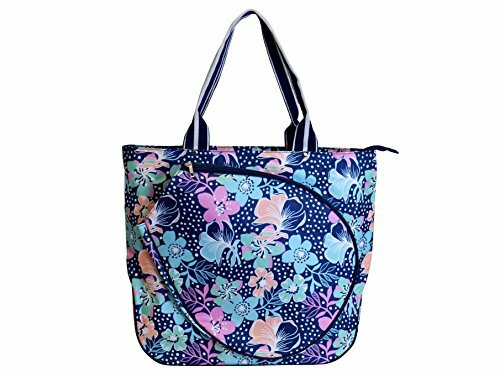 Aside from the obviously beautiful designs, the All for Color Tennis Tote boasts a variety of useful features to make it a quality choice for a tennis bag. Eight different designs allow you to customize the bag to your style. They are made from polyester, making the bags resilient and long-lasting. At 19” x 16” x 6”, they are not quite large enough to hold a racket effectively in the main compartment. Thankfully, they have a 2-racket compartment on the outside of the bag, which allows you to utilize the entirety of the main compartment for your gear. The main compartment is large enough to carry most things you will need. Tennis shoes, extra balls, a water bottle, and more will fit with ease. What’s even better is that the tote has pockets and clips to hold your keys, phone, and more. This saves you from needing to rummage around your other stuff to find smaller items that fall to the bottom. A limiting factor of this bag could be the price. It is relatively expensive relative to many other handheld bags, without offering as much utility as a tennis backpack would. Many beginners likely wouldn’t need all the storage, making a cheaper option a viable alternative if you do not care as much about the look. A tennis backpack would also be much more mobile than this bag, making a backpack a better choice for traveling players. To get the most out of the tote, you will want to take advantage of all the storage space it offers. For its size, it has exceptional storage capacity, making it ideal for those who need to carry a lot of gear. The pockets inside make sorting your gear easy, and the racket compartment helps to protect them from damage without taking up your primary storage space. It should also be used primarily for short travel, such as trips to school or to and from the tennis courts. This is because it focuses more on storage capability than portability. If you do not care as much about the look of the bag, or do not need quite as much storage space you could consider the Wilson Advantage II Tennis Bag. It is about half the price, with a main compartment that holds up to 2 rackets as well as any larger items of gear like shoes, balls, and more. You can keep your smaller things in the accessory pocket that is on the outside and can carry it on your shoulder to make transport simple. The All for Color Tennis Tote lives up to its name. The wide array of design choices makes it the perfect bag for anyone looking to stick out. It has more than enough storage for most players, permitting that they do not need to carry more than 2 rackets in the racket compartment. The tote is a little bit pricey, but for the amount of storage it offers and the beautiful designs, it is a solid choice for trips to and from the court.